Dark here, folks, coming off little sleep with the birth of my newest Blueshirt fan. Having not watched the games against Tampa and Florida this weekend, I thought it was just sleep deprivation when I read that both games against the worst teams in the NHL resulted in tragic, lazy losses ending our long awaited 'turn around to the playoff' run. Schucks. It also seemed odd to me that mini-Dark's dirty diapers looked strangely like the NY Islanders' new jersies, but so I digress. When reality set in, I didn't have it in me to watch the recorded games and comment on them. Rather, it was probably more productive to forget these weekend games and pretend like they never happened because it seems strangely parallel to much of the earlier criticisms we've all shared regarding the drive and wants of this Blueshirt squad. The Ranger bloggers have done a fairly consistent, positive assessment of Henrik Lundqvist, goaltender of the stars (okay..People Magazine), on getting his 'mojo' back as we approach this season's potential playoff period. I say "potential" because if the team continues to exhibit this level of play with only three points from not making the playoffs, we will earn the ninth or tenth spot in the conference to the horror of all that love and cherish the Rangers legacy. Short and sweet, but a huge 'shout-out' to Jibblescribbits, Pucks on Broadway and The High Flier for covering last week and continuing the Dark-ness of hockey around the NHL. The posts were great and a pleasure to have writers contribute to the site. Keep writing, keep reading and all posts are welcome. Cheers readers and Dark-ness is back -- and hopefully, that means wins. 2) We have a new 'Faux' about to pop any day as well, but we're baby 'veterans' by now. Enjoy, as they grow like weeds! Congratulations to you and your wife on the birth of the newest Dark Ranger. 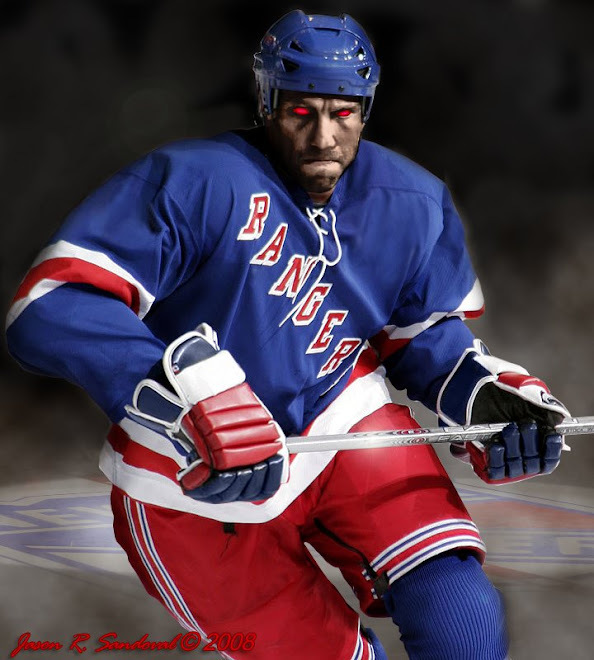 Forget the Rangers and enjoy the new addition. thanks faux and congrats to you as well...it's the 2nd for the Dark Ranger so for now it's just sleep. who needs it when there's so much great NY Rangers hockey to watch over and over..my first 3-yrs old will be going to his first game next september....exciting stuff. pundit,...perhaps some of the best advice this year thus far. there is a good chance we will not see playoff action this season. the pittsburgh game tomorrow will be telling.